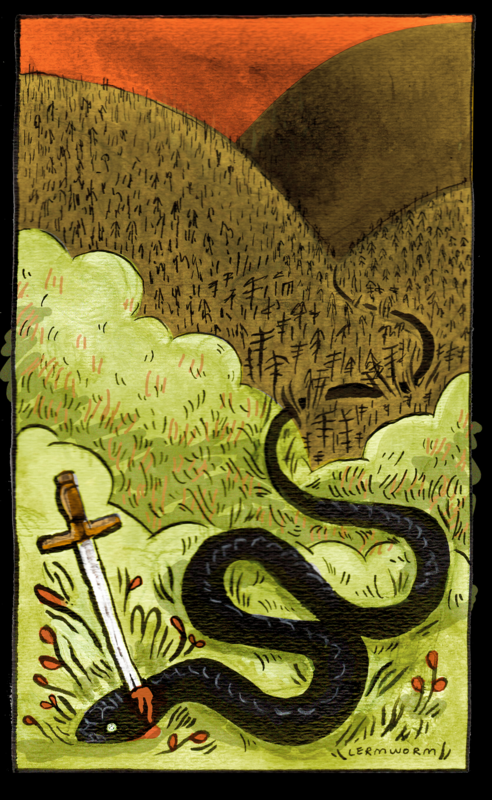 Image caption: Art by Gina Lerman of a snake with a sword through its neck. As ecological catastrophes happen more frequently, scientists’ predictions of climate change become grimmer. Our inability to stop the destruction of the planet is partially due to the persistent, heel-in-the-ground attitude of the global financial system and its representatives in government who ensure that little is done. Under a capitalist system, the economy depends on corporations making more money and expanding their markets. Politicians in collaboration with corporate lobbyists enact policies that create an atmosphere favorable to corporate investment, at best tossing a few crumbs to environmental advocates. For those concerned with averting catastrophe, a thorough reckoning with the logic of capital and colonialism needs to be done. Let’s start in Pennsylvania. Two major pipeline projects — the PennEast pipeline and the Mariner East 2 pipeline — threaten the Delaware River watershed, on which all life in our region depends. The fossil fuel industry is determined to expand its profits by increasing the flow of fracked gas and natural gas liquids to faraway markets. These fossil fuels will either be burned and speed up climate change or be turned into plastics that will end up in landfills or the ocean. According to the Pipeline and Hazardous Materials Safety Administration (PHMSA), there were 92,407 miles of pipelines carrying natural gas and liquid petroleum products in Pennsylvania in 2017. That distance is the same as 151 round trips between Philadelphia and Pittsburgh on the Pennsylvania Turnpike. The FracTracker Alliance has created a map showing the locations and other details of spills and other dangerous incidents along pipelines across the state. Construction on the $2.5 billion Mariner East 2 pipeline began in February 2017 and has already resulted in more than a hundred spills. The Department of Environmental Protection has issued more than 60 violations to Sunoco for pollution and destroying private water wells. Drilling mud spills have polluted important wetlands and trout streams, and a Chester County community lost the use of its drinking water. In South-Central Pennsylvania, retired teacher and grandmother Ellen Sue Gerhart documented the impacts of pipeline construction through her land, such as sedimentation, spills, and improper erosion controls. Gerhart has lived on her family’s land for 35 years. She and her family have not given permission for Sunoco and its parent company, Energy Transfer Partners, to build there — Sunoco used eminent domain to establish the legal right to cut through the land where the Gerharts live. According to a statement released by the family, on May 23, Sunoco spilled 4,000 gallons of drilling fluid on their land, threatening the Gerharts’ well water. On July 27, sheriff’s officers arrested Gerhart on her land in retaliation for her resistance. Energy Transfer Partners successfully filed a motion to revoke her bail, and Gerhart was sentenced to two to six months in jail. Since then, according to Food and Water Watch, five women have been arrested for having picnics and holding bake sales along the pipeline route to interfere with construction. A Lakota prophecy that a great black snake will cut through the land and bring destruction to the people and the earth inspired Native American water protectors at Standing Rock to resist construction of the Dakota Access Pipeline through their land in North Dakota. But the black snake continues to roam, and the destruction continues. The capitalist elite’s need to maximize profit requires a complete disregard for the possibility of a planet unsuitable for organized life. The logic of power in the United States remains unchanged since 1492: the logic that ethnically cleansed Indigenous peoples, enslaved Africans, turned women into property, felled ancient forests and slaughtered species to extinction. The solution then is simple: In order to break from our ecocidal course, we need to fundamentally change the logic of power. We need to envision an end to capitalism and colonialism. The heroic efforts of pipeline resistance movements are rooted in a politics and history that have opposed the dominant logics of capital since 1492. To name only a few struggles: the hundreds of tribes who united against the Dakota Access Pipeline, the Ramapough Lunaape against the Pilgrim Pipeline, the movement against the Potomac Pipeline, the Mountain Valley Pipeline encampment, the Unist’ot’en who have fought pipelines by directly reoccupying their traditional lands, and the Mohawks of Kanesatake’s defeat of two of TransCanada’s pipelines. These efforts offer a genuine alternative to global capitalism — one that values human life and the planet. While the dozens of ongoing pipeline resistance movements offer hope and encouragement, they are ultimately defensive. Cautious optimism can be justified by the polling of opinions on the Keystone XL and Dakota Access Pipelines. Before sustained movements, opinion was decisively in favor of the pipelines, but roughly around the movements’ height, public opinion turned to a small majority opposed. The direct action of local communities and Indigenous peoples made that change happen. A simple environmentalist approach lacks a critique of how colonialism and capitalism legitimize the wholesale destruction of the natural world and seem eager to dive headlong into a new mass extinction. To address climate change without addressing colonialism and capitalism is not simply unjust, it prevents us from finding a solution and fighting for it.